Washington, D.C., officials acknowledge “technical issues” have been causing problems with the city’s release of public records. The problems, which have affected Freedom of Information Act requests in recent months, have prevented the release of city emails and memos requested by the News4 I-Team on several occasions in 2015 and 2016. The I-Team discovered problems with D.C. government responses to Freedom of Information Act requests during a review of city records in advance of Sunshine Week, a national week of awareness highlighting the importance of transparent government. The problems acknowledged by the city prevented the release of emails and records from the mayor’s office, the Department of Public Works and the DC Public Schools system. In each case, approximately 100 pages of records were withheld from public records requests, including requests into how the city handled snow response and school athletics finances. In February, the office of Mayor Muriel Bowser formally notified the I-Team it had recovered zero snow-related emails from top officials of the office during a small but paralyzing winter storm Jan. 20. When the I-Team appealed, the office produced dozens of emails, including some exchanges between mayoral aides criticizing the condition of roads in the city. But the city would later acknowledge that it failed initially to turn over dozens more pages of public works emails, after the I-Team’s request. A separate cache of emails was sent weeks later. The records sought by the I-Team provide a timeline illustrating when city officials adjusted their response to the Jan. 20 snow event. The emails show the city upgraded its snow response level from “prowl” to “partial” at 3 p.m. that day, about an hour before precipitation began paralyzing the area. The emails also show public works staffers and city officials actively seeking equipment and pricing for snow removal for the Jan. 22 blizzard during the peak of the Jan. 20 snow event. The city spokesman said four incomplete records requests were affected, all of them after Dec. 31. “Those searches were reran and resent to requestors,” he said. A further review by the I-Team found a similar public records failure before the Dec. 31 date cited by the city. D.C. Public Schools reported zero emails were found in a search for communications about the agency’s athletics department in December 2015. When the I-Team challenged the school district’s claim, the agency produced dozens of pages of internal communications and emails. 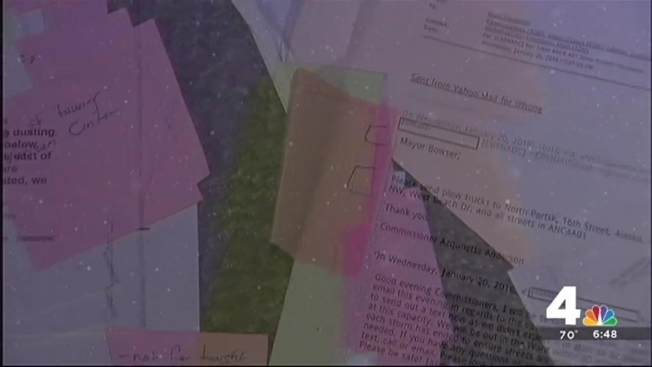 A school district spokeswoman declined to answer questions from the I-Team about the flawed search for public records.